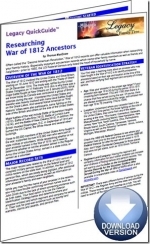 The�Researching War of 1812 Ancestors�Legacy QuickGuide™ contains valuable information so you can understand the history of the War of 1812 and the records created about the veterans who fought in the conflict. You’ll learn how to devise a Veteran Identification Strategy as well as what records exist both online, on microfilm and in print. Records covered include service records, bounty land records, pension files, casualty records, records for African-American and Native American veterans and more. The U.S. Civil War lasted just over four years, from the attack on Fort Sumter in April 1861 through the official end of the war declared by U.S. President Andrew Johnson on 9 May 1865. The War affected the lives of almost everyone in the country, either directly or indirectly. 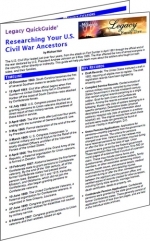 The Researching Your U.S. Civil War Ancestors Legacy QuickGuide™ contains useful information to get you started on learning more about the soldiers who fought on both sides, and their families.